It is that time of year again, cold (it has just snowed in Tucson, Arizona! 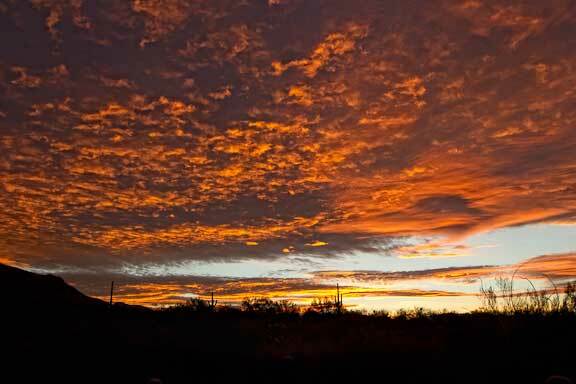 ), yet invigorating, with spectacular sunrises the norm whenever there are early morning clouds. If you have a mega yacht you are going to want a mega dinghy. Judging from our brief exposure to this scene in the Med. the criteria for these boats begins with style. Take the design above. Ver cool looking, assuredly quick, wet, and hard riding. 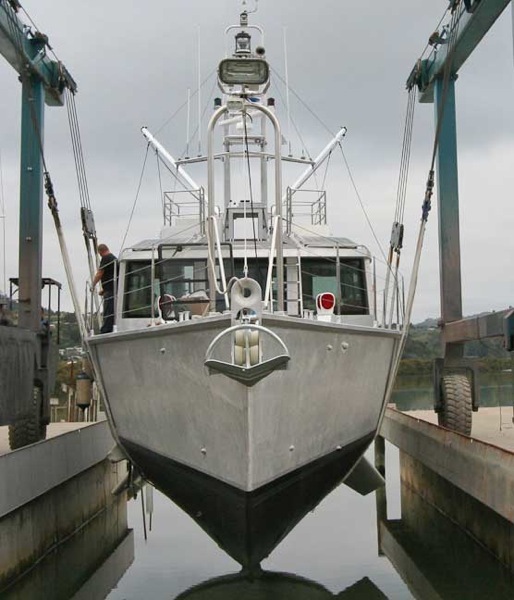 Drop the mooring pennant and unroll the jib to pull the bow off the wind in the desired direction. Use momentum from reaching to go head to wind, then raise the main. Back wind jib to get the bow to pay off. Quietly acknowledge kudos from the moored (and jealous) spectators. A few weeks ago Ben Ellison had a story on a program called “Firesheep” which makes hacking WiFi signals much easier. Recently John Harries had an even better discussion on his website (be sure to read the comments on both). This issue is of concern to anyone who uses WiFi to send data they would not otherwise want in the hands of someone intent on no good. 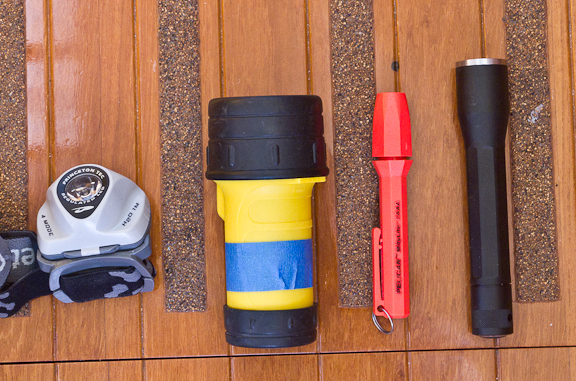 We have a large, somewhat eclectic collection of flashlights aboard Wind Horse. The photo above is a sample of the various types. Each has a special purpose. If you are looking to spice up your computer we have added a series of photos to our collection of screen savers. We’re back in our land base with a wonderful welcoming committee. First a pick up at the airport by friends (circumnavigators Michael and Nancy Morrell). 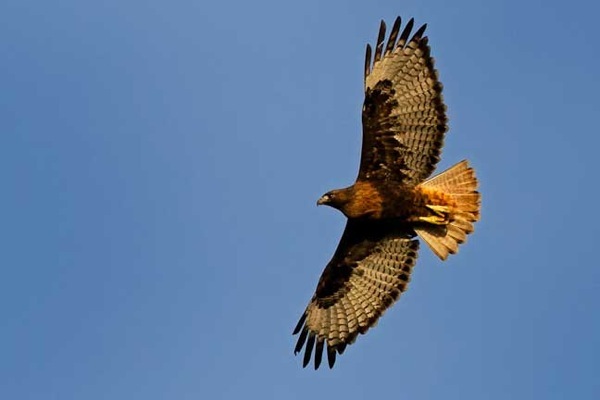 Then a red tail hawk sitting on a sahauro cactus in our back yard. who obligingly took flight after we had unpacked the cameras. 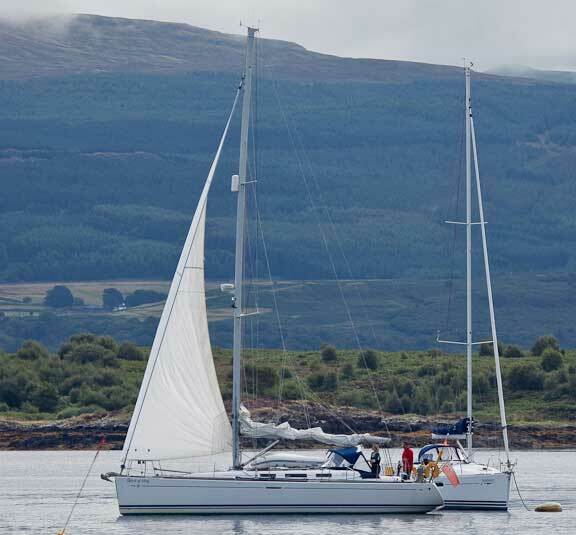 Long time SetSail visitors will know that our personal preference in cruising grounds tends toward invigorating (challenging) environments, ideally isolated, where we are totally on our own. 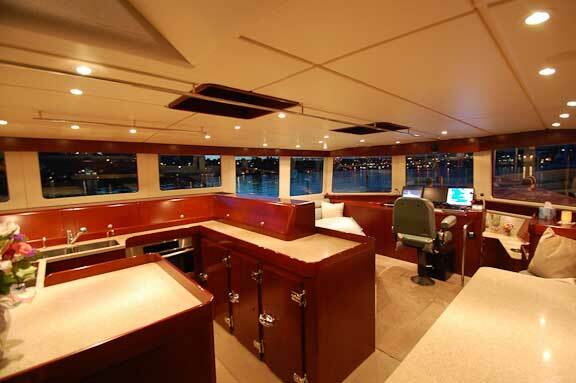 During the 2008 cruising season we shared an anchorage with another yacht just once, last year three times. The normal route back to the States from Europe for us would be Iceland, Greenland, and then Newfoundland, or direct from Ireland to Newfoundland. A series of factors had us deciding on a more user friendly routing, via Spain, Portugal, and Canary Islands, even though it meant dealing with the crowds that come with civilization. 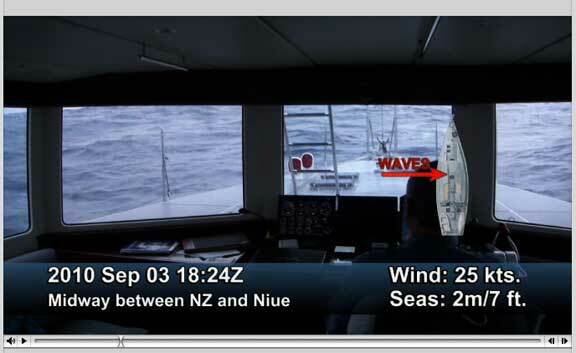 We have been slowly discovering the changes in the software on the Furuno 2117 radar, included in our recent upgrade. 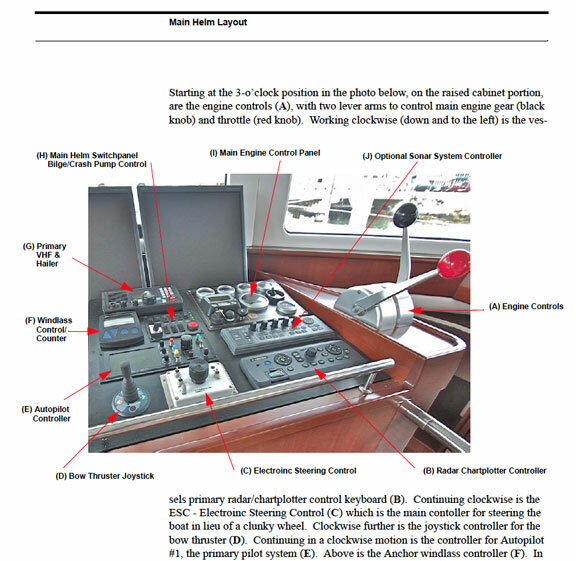 This is an IMO class piece of hardware, in other words, used on commercial vessels, and as such the interface must conform to certain international standards. The screen shot above is in t’he AIS display filter menu. 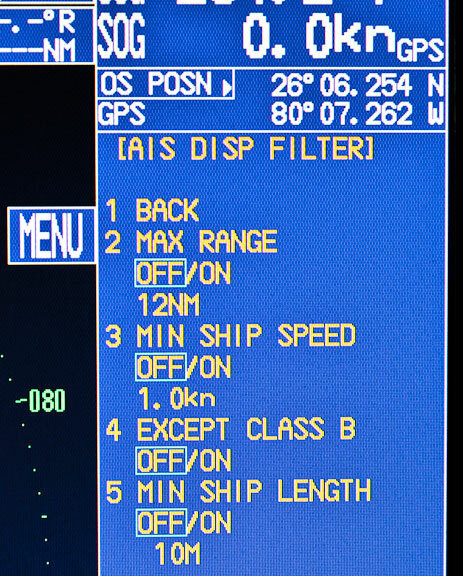 Note the comments on class B AIS and minimum ship length. Wind Horse is secured at the end of 14th Street in Fort Lauderdale, ready for a well earned rest. Yesterday we went by the dock on 15th where 30 years ago we lived aboard Intermezzo ll testing the market for our concept of a proper cruising yacht. In some ways it feels like we have closed the circle on that endeavor. 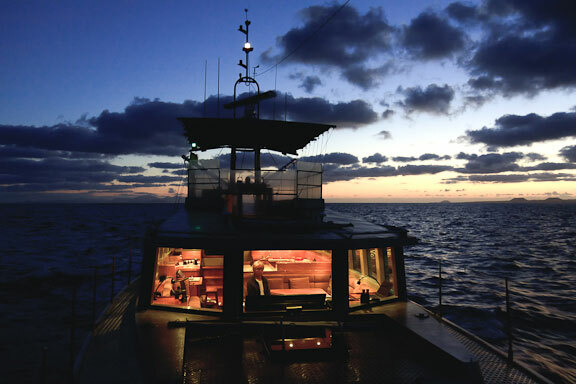 The sun has set on the last day of this year’s cruising. 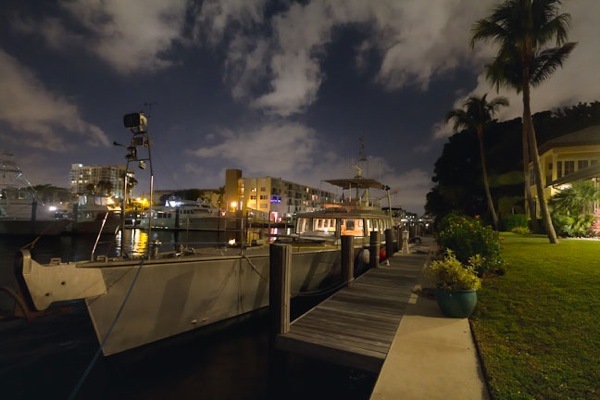 We will be off Port Everglades inlet (Fort Lauderdale) at first light. A winter dock lies in wait, as do e-mails and phone calls too numerous to contemplate. The whirl starts back tomorrow. The recent sojourn across the Atlantic Ocean has been one of our more enjoyable long passages, made all the more so by friends, new and old, on both sides of the pond. Pete Rossin brought along his new iPad loaded with various cruiser friendly apps. What initially impressed the most is the ability to carry various manuals around, and use them in situ as required. 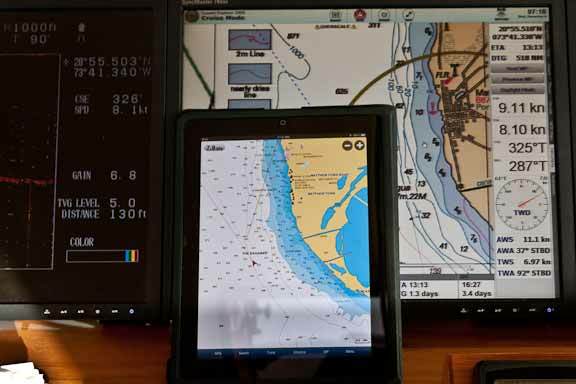 But the navigation potential really got our interest this morning off Great Inagua’s Matthew Town. So here we are 16 days and 3700 miles from Las Palmas in the old world, at anchor on our own in the new, with a deserted white sand beach a dinghy ride away. The “Q” flag is at the port spreader, a Bahamian courtesy flag at the starboard, and tomorrow we shall see what Great Inaugua has to offer. We are just 500 miles from the terminus of this year’s cruise, and although holidays with the family loom, neither of us are ready to leave Wind Horse. We almost didn’t stop, not wanting to break our seagoing rhythm. But then the words “60,000 flamingos” jumped off the page, and now our anchor is firmly set, dinner is about to be served, and a movie watched. Tomorrow begins a new adventure. Time For A Break – Or, What Time Is It? 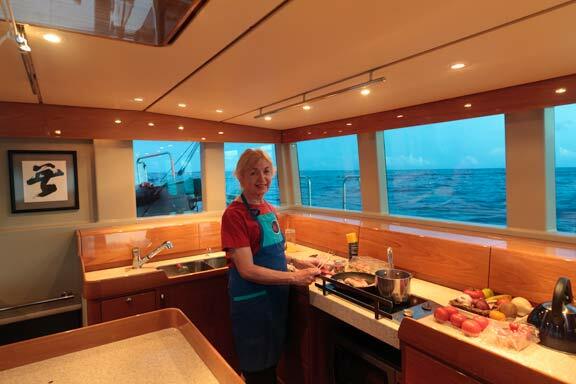 To the detail oriented amongst SetSailors it will be obvious your seagoing correspondents have lost track of the calender, a sure sign it is time for a break from cruising. Part of the problem is the change in time zones that occurs when you are voyaging. Do you adjust the clocks on board, leave them on GMT, the time of the departure point, or change to the destination? Sunday evening, there is a lovely northeast breeze, a gentle motion, a half a knot of positive current, and we are at sea. 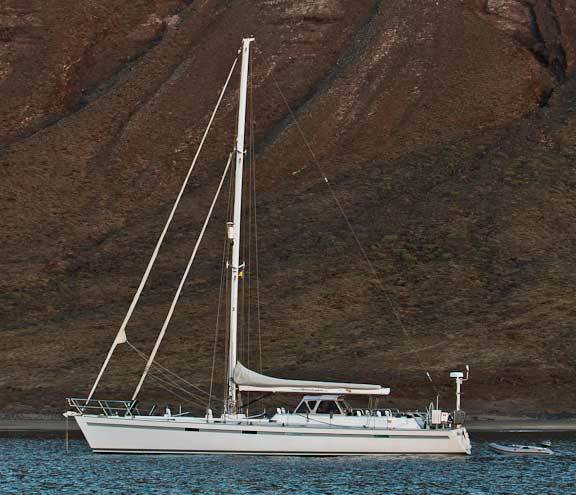 It would have been fun to greet our Las Palmas neighbors on the Swan 80, Berenice, when they arrive Monday, but after sitting for three days we have itchy feet and so we are off. 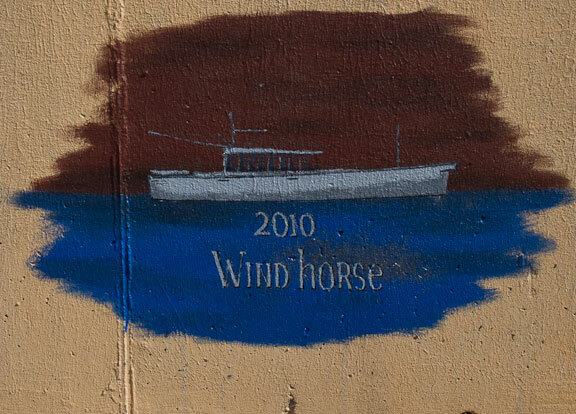 The current plan is direct to Fort Lauderdale where Wind Horse shall spend the winter. 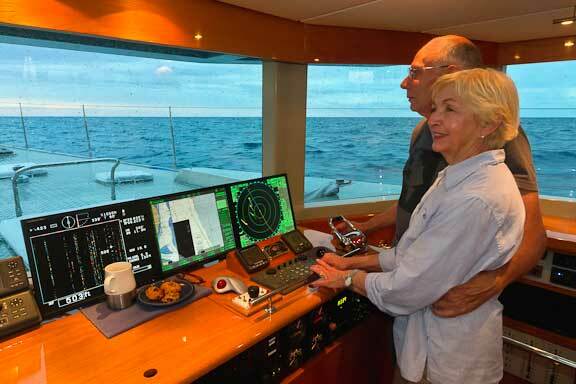 The projected route takes us through the Mona Passage between Puerto Rico and the Dominican Republic, then along the Bahamas southern and western flanks. 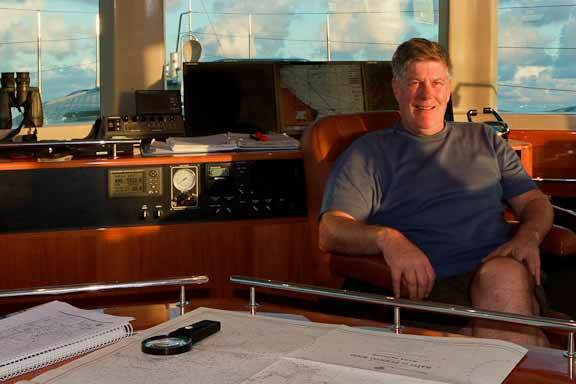 Navigation should be more interesting than that of the recently completed “Pond” crossing. When the Port Authorities saw our clearance paperwork this morning they could not understand why anyone would leave so soon after crossing the Atlantic, let alone tack on 1400 miles to Florida without a stop. You might be wondering the same. 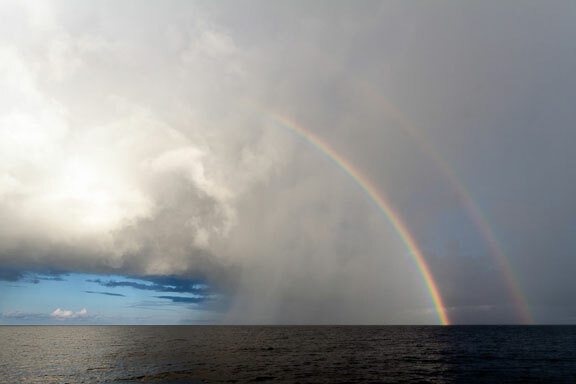 The reasoning is straightforward: we are comfortable at sea, we have had a friend join us for the passage so the watch standing will be easier, and there is a good weather forecast we do not want to waste. Now a comment for the gear heads reading this. 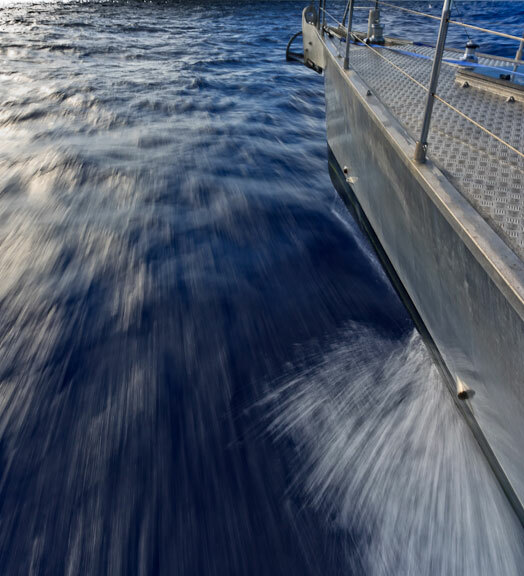 For the last half of our crossing from Las Palmas the exhaust gas temperature (EGT) for the starboard engine ran about five percent warmer than the port, notice that something had changed. It could have been an injector issue but a clean exhaust ruled this out. The prop was OK. That left air flow, i.e the turbo. Once underway we did a couple of tests at wide open throttle to check EGT and max RPM. The starboard engine was about 50 revs slower. Next we did both engines at WOT together. 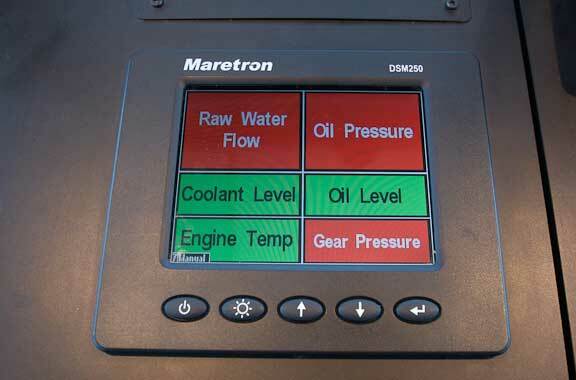 After logging this data we noticed the starboard engine EGT was now the same as the port at cruise RPMS. The theory here is the turbo must have been sticky, and the added pressure of running WOT has freed it. Freed from tyranny of a slow and expensive Internet connection at sea and now with serious speed in Rodney Bay, Saint Lucia, we have uploaded some of our favorite photos of the last two weeks. Our last night at sea and we’ve been chasing squalls for their restorative powers. 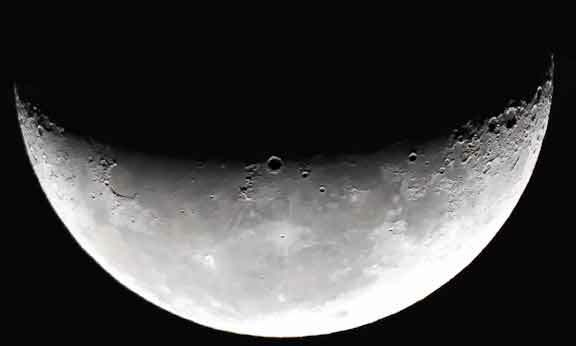 A night of black clouds gives way to clear sky before dawn and the last moon of this passage bids us farewell. Another collection of photos for your viewing pleasure. 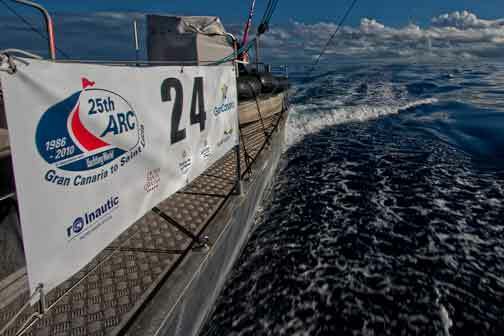 Finally, with 550 nautical miles to go, the Atlantic wind gods have seen fit to authorize a dose of northeast trades. 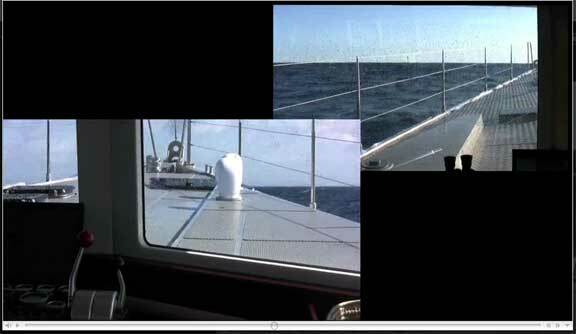 Wind Horse is now enjoying a broad reach, with 15 to 20 knots of breeze at a 150 degree true wind angle. If we were sailing now we’d be carrying kites on both main and mizzen, fully powered up, surfing continuously,and wondering should we shorten down for the squalls? 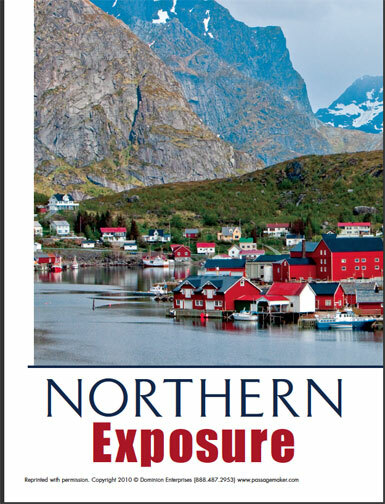 The November issue of PassageMaker magazine has an article of ours on cruising Norway. The folks at PM have been kind enough to allow us to share the piece in PDF form. Greetings from the FPB Wind Horse where for most of the past 24 hours the sea state could be considered less than conducive to wandering the planet aboard your home afloat. As sometimes happens, we have been discussing the state of the world, our position in it, and the hard life of the trans Atlantic sailor. Greetings from the FPB Wind Horse where there are now significantly more ocean astern than ahead. The last few days we have been concentrating our intellectual resources on weather routing. We have the tools to make this a pleasant passage in spite of the unusual weather, if we use them correctly. Hence an obsession with grib files, weather faxes, local conditions, and our good luck totem. Greetings and salutations from the FPB Wind Horse, the crew of which is about to partake in an officially sanctioned half way there party this evening. 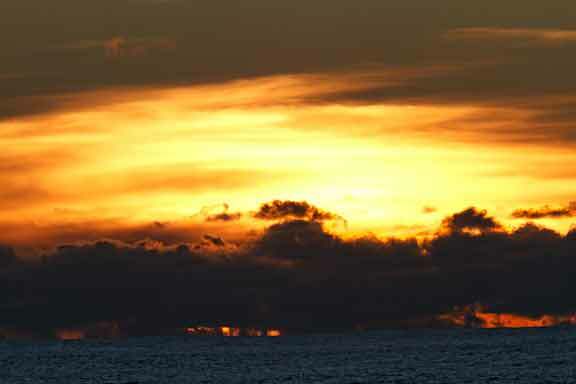 Thursday morning, 25th of November,the front is well behind us, seas are calm and the breeze almost fair. The Wind Horse executive committee has convened and after due consideration declared:(a)a bath and shower are the first order of business; (b) Thanksgiving holiday shall take place on it official date; (c) Pumpkin pie will be the first off the oven production line; (d) Steve shall engage the services of a barber (note that item (d) shall take place prior to (a). The maintenance staff aboard are directed to do a wash and dry cycle with the laundry facilities, and (should a rain squall not appear by 1600)rinse the salt of the windows. So here we are on a “downwind” passage with 25 knots+ blowing straight from St Lucia. There is a steep two to occasional three meter (six to ten foot) sea running, close coupled of course. Nothing like two waves per boat length to help with digestion (and diet). You might say we are just paying our dues since we have been able to avoid slogging to weather this entire cruising season. This morning brought a wonderful sunrise with the moon still well above the horizon. Those of you old enough to recall the days before Sat Nav and GPS will recognize the navigational benefits this used to confer. Not only good visibility during the evening, but you could get celestial lines of position during the night if it was clear, and sometimes a crossing LOP from a planet. 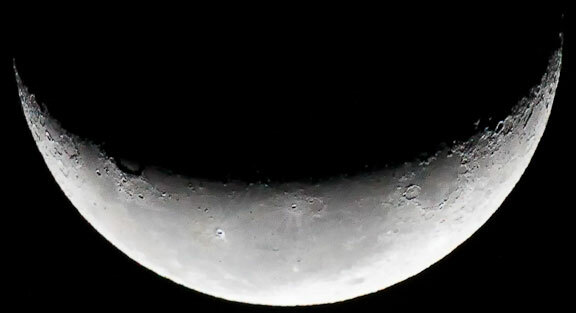 A few days after the full moon, during the day offered crossing LOPs from sun and moon. Hence the cruising fleet tended to move on a full moon. 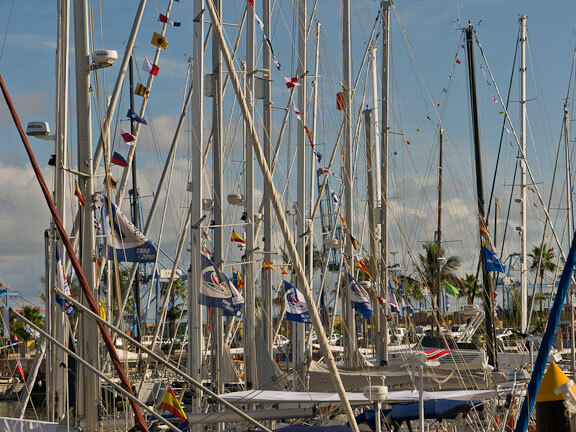 Each day a little after noon ARC headquarters sends out a list of boats, positions, and distance to the finish in a text file. This afternoon we are pleased to report that on our own we were able to import this into an Excel spreadsheet, and sort for distance to the finish. It makes for an interesting study if you are not otherwise occupied. 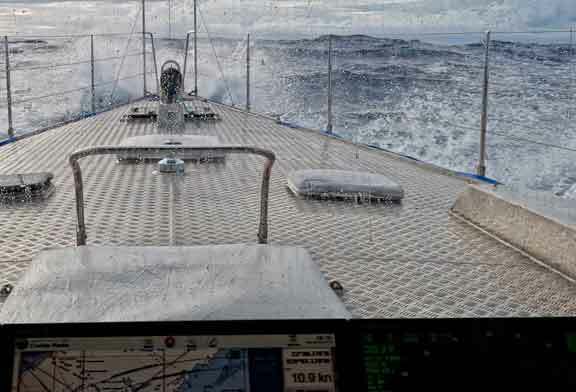 The first thing to note is that Berenice, the Swan 80, is 204 nautical miles behind Wind Horse after 71 hours. More interesting is the little Open 40, 58 miles behind the Swan. 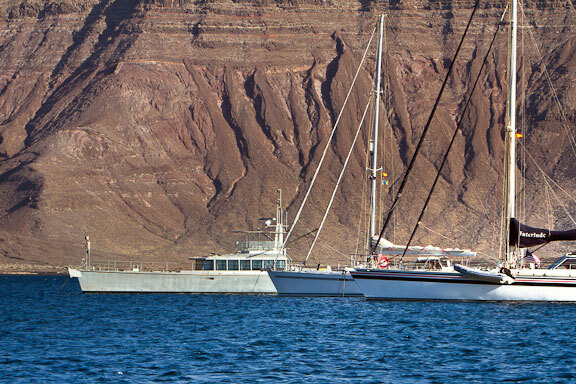 There is a group of half a dozen yachts that have followed us west rather than sailing south to pick up the trades. The latter are running out of wind and the prognosis does not look favorable. The radio is buzzing with folks discussing a detour to the Cape Verdes for fuel. This might make sense for another reason. There are strong headwinds forecast a few days hence in the east. Meanwhile, aboard Wind Horse we are doing our usual eleven knots. The southerly breeze, formerly on the beam, has started to swing to the western quadrants, where is is prog’d to stay until tomorrow when we are promised light NE for Thanksgiving. The three boats closest behind us are all north of our track. The GFS weather model shows some difficulty for them over the next 48 hours. Hopefully we can extend our spacing as when they get into the trades – the Open 40 in particular – our lead should rapidly vanish. It would not surprise us at all to see a big kite bearing down on us as we close with Saint Lucia. Mind you, we are an Unsailboat and therefor not racing anyone… except the clock. 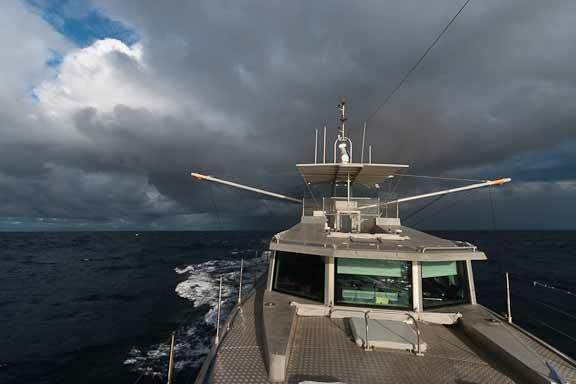 Squalls seemed to be on the mind of a lot of the cruisers with whom we chatted in Las Palmas. As we have had two sets of line squalls in the last 18 hours, we thought a few comments might be of interest. Since we will be unable to send photos while we are at sea we have put together a high res side show of our favorite photographs from Playa Francesa to fill the void. Click here to open the web page. To view these full screen touch the “F” key or click on the box bottom right of the slide show screen. We have had a lovely evening with full moon, eight to ten knots of breeze over the stern, waves just big enough for the odd surf, and nothing on the horizon. As always, it feels wonderful to be free of the land, surrounded by water and sky. The galley magically produced a delicious pasta dinner from the stash in the freezer and we have been practicing self control regarding the chocolate chip cookies. Radio propagation is good and there are strong signals from the weather fax stations in Baton Rouge and Boston. What is shown confirms the raw GFS model grib data downloaded with Saildocs. It is not pretty. The forecast has deteriorated, with a large trough now extending across and south of the great circle route to Saint Lucia. 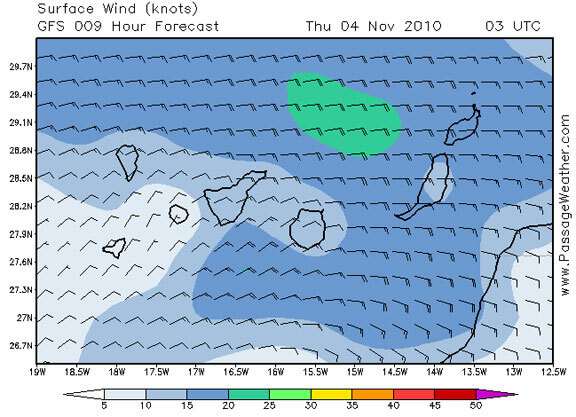 This looks to be around for a week bringing headwinds close to the course we would like and light airs south. For the smaller boats and those with limited range under power this is shaping up to be a long passage. Just after midnight there was a soft, barely perceptible deceleration, and the revs dropped on the starboard engine. 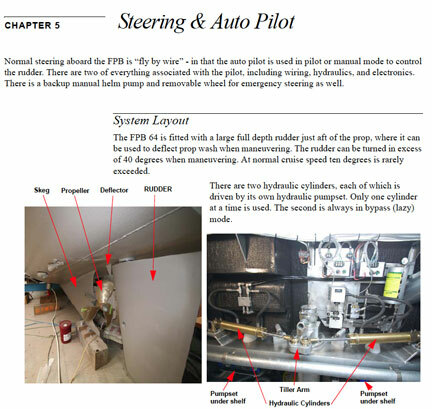 Fuel filter gauges looked good, the throttle linkage checked out, and when the Morse cable was removed from the injection pump arm moving the throttle actuator by hand did not change the result. The exhaust gas temperature climbed rapidly when trying to run up the revs indicsting something was loading the prop. A further clue was the fact that the engine revs were fine out of gear. The above issue notwithstanding, progress is on target, running at 1800 RPM for 11 knots, averaging a bit more with a favorable current. Weather tactics are comples. For now we will stick with the great circle but kick up the speed a touch. There is a chance we can get far enough west and avoid or minimize the forecast unpleasantness. We have successfully resisted the temptation to start at the pin with the gun. Hanging back, making a conservative start, allowed us to watch Berenice roll Steinlager. We suspect that a hard luff would have ended this had a more aggressive crew been watching their weather hip. It is 45 minutes until our start and there is time for a quick update. We’ve been sent off from the dock with a marching band, a first for us. 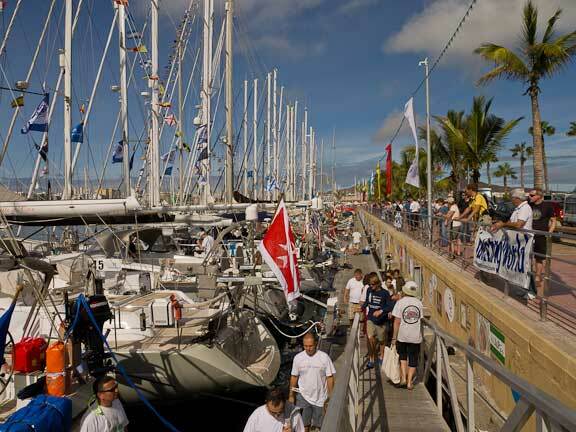 It is Saturday and tomorrow we and 238 other yachts start for St. Lucia. 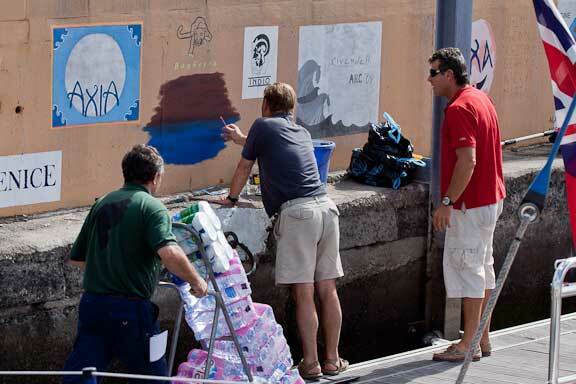 We have enjoyed our time in Las Palmas, but are really looking forward to getting out to sea. Two days to go until the starting gun fires. There is a definite sense of anticipation in the air. 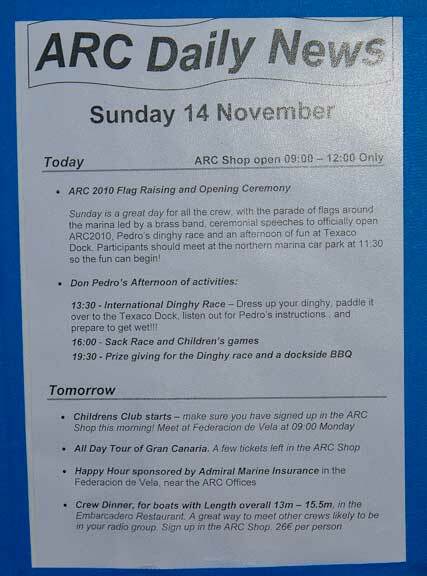 The docks are buzzing, the crews walking briskly, sails are being run up, sheets led, and there is a never ending parade of supplies marching by our stern. There are so many sources of weather data on the Internet what to use can become confusing. 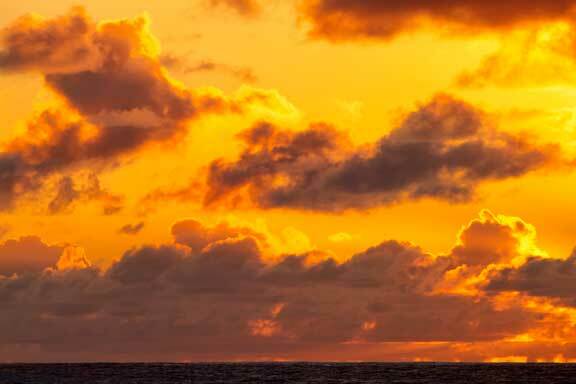 There are a series of sights we check twice a day, to get a feel f or the rhythm of the weather, which incidentally is shaping up for a fast sailing passage if what we are seeing now holds. There are all sorts of competitions within the ARC. There is wall painting, a costume ball tonight (we have other plans), and then the passage itself. Being a cruising race those who choose not to join the racing division – most of the boats – are allowed to use their engines. 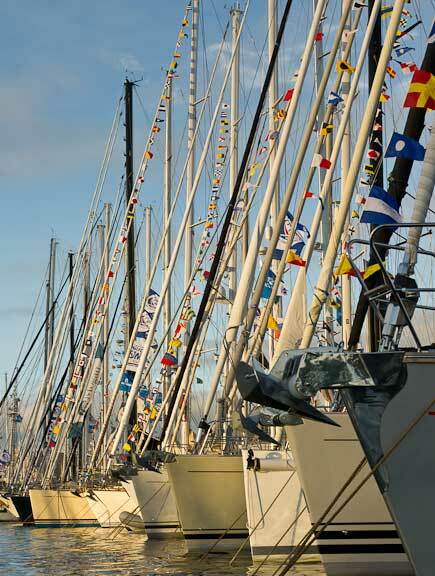 Seeing Moonshadow ensconced between two broad beamed production yachts got us to thinking. She is a few feet longer than either of her neighbors, significantly less beamy, with a rig one quarter or more shorter. 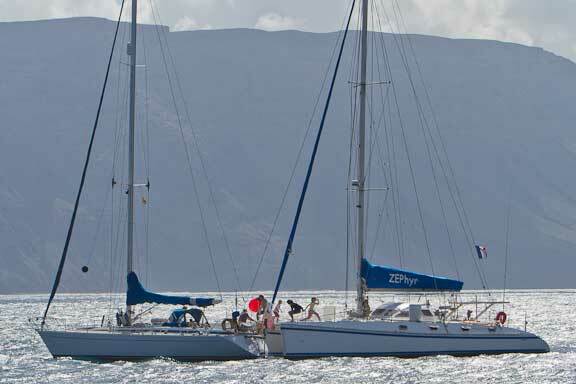 Which configuration do you suppose is quicker, or would you rather sail short-handed across the ocean? 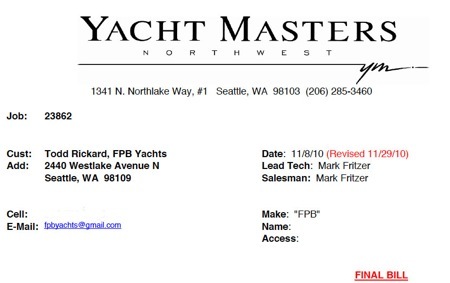 In pre FPB days it would take us two or three days of work to check the sails, rig, rigging, engine, and systems. With Wind Horse this is down to half a day. We started in the engine room yesterday, got interrupted, and finished this morning. 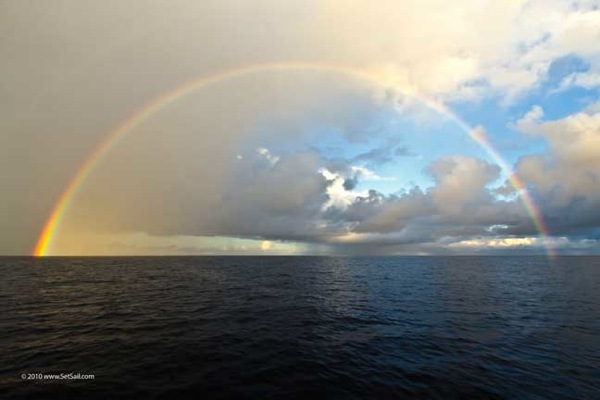 Colorado State University has published its review of the 2010 Atlantic hurricane season. We’re interested because the more robust the season has been to date, the less the odds are we will have to deal with a late tropical storm, or worse, as we make our way to the Caribbean and on to Florida. We have been caught up in the ARC whirl. There are evening events to attend, cruisers to chat up, a talk to give, all interspersed with our continuing FPB endeavors. We have yet to see the lights out before 0100. 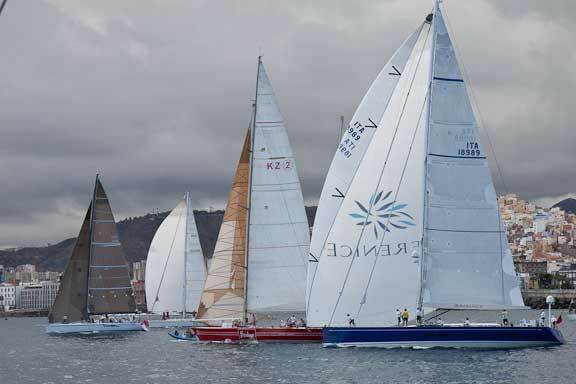 We are now in Las Palmas with 250 other yachts who are preparing to take part in the 25th running of the Atlantic Rally for Cruising, or ARC as it is known. We have been stunned by the reaction t the FPB 112 (or Big Sister as we call her) and want to thank everyone for their kind words. The first profile drawing shows a 19 foot /5.7m dinghy on the aft deck. As this rather detracts from the appearance, and would not be there if you were admiring your vessel at anchor (since you would be in the dinghy), we thought we should start the day with a cleaner view. Over the next week we’ll upload a series of drawings showing different aspects of this design, along with comments on how we see the boat being used, its performance, and some of the unique features that are possible in this size of FPB. Right now, let’s give you the basic data. 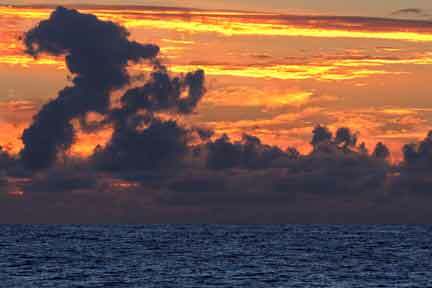 The promise of dawn at sea pulls us from a snug bed this morning and has us underway by 0500. The distance to Las Palmas is short, just 95 miles, and the early start is an endeavor to get the ARC paperwork sorted out before the herd begins to arrive. 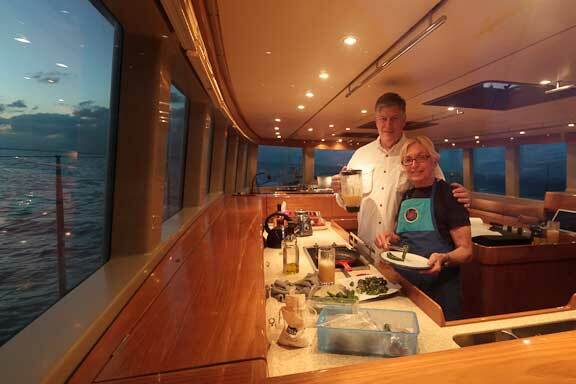 Our cruising mode the last five years has been one of constant movement, high latitudes, and being on our own. 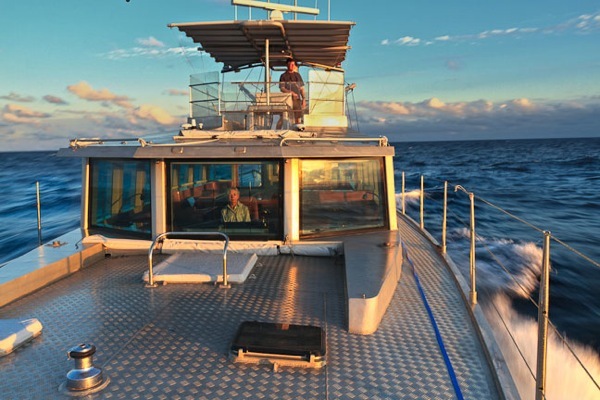 This season our MO has been more traditional, spending time sitting, making new friends in the cruising fleet, and getting to know the locals. 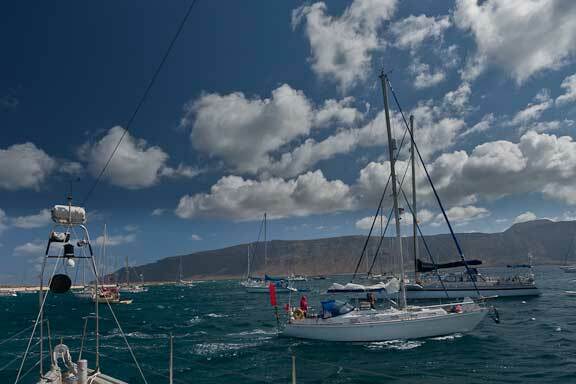 The three weeks spent anchored in Playa Francesa is a record for sitting in one place for Wind Horse. In the last few days the anchorage has cleared out with just a few boats left, amongst whom are Interlude and Moonshadow.anchored with us in the lead photo. We have been watching the pattern of the North Atlantic weather for the past month, in preparation for our coming trip across the pond. 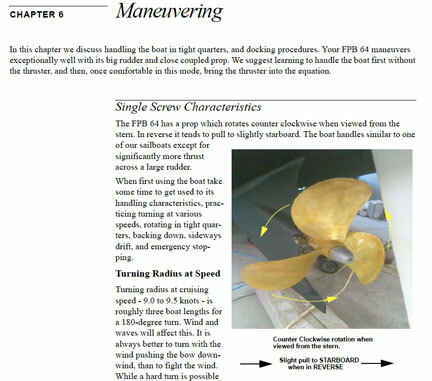 NOAA continues to create new web based products to ease the mariner’s job one of which is a URL with the complete fax run in one document (http://www.opc.ncep.noaa.gov/shtml/A_brief.shtml). 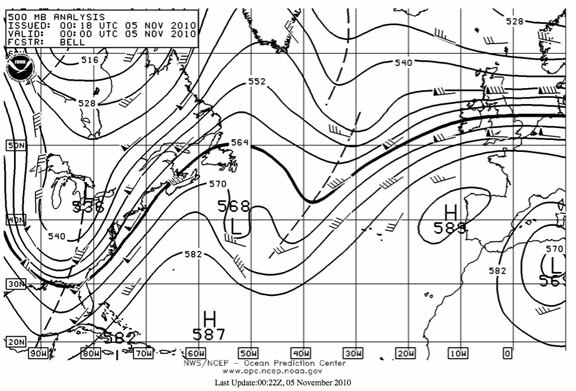 Last night and again this morning the 500mb chart showed rigorous upper level troughs at both ends of the Atlantic. (since the weather we experience at the surface starts in the upper atmosphere, understanding 500mb charts is of critical importance). In this case, the two troughs shown above, rotated as they are to the west, promise real blows in the next day or two as they rotate to the east. Here is a benign looking grib file (Playa Francesa, where we are anchored,is off the tip of the northeastern island). The GFS model, usually pretty accurate, is saying 10 to 15 knots. if we were in the open ocean it would probably be OK. But there is a large island immediately to windward of the anchorage, and the weather models typically do not do well with the affect of land masses on local weather. 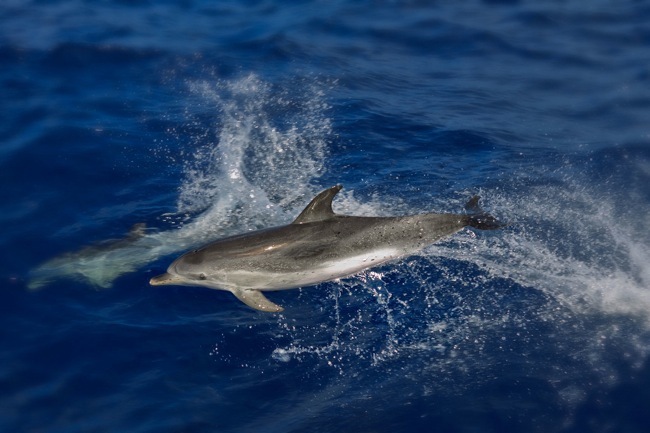 It is that time of year, the Azores high is pumping out a lovely trade wind breeze, and at anchor eventually you make peace with the conditions and get on with enjoying the environment. 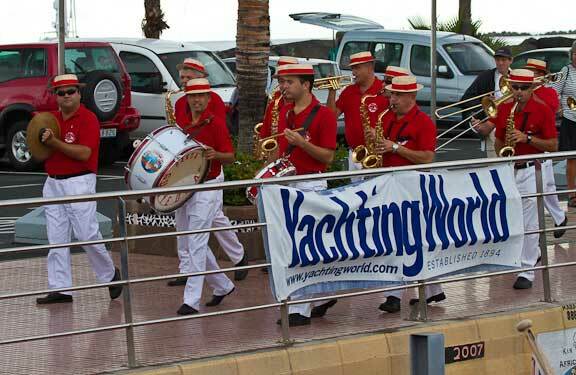 Cruising yachts are arriving and departing, making new friends and renewing old acquaintances. Although halloween is primarily a US holiday, it has been adopted by cruising kids around the globe. Here in Playa Francesa, Canary Islands, the kids are out early trick or treating. The breeze is up at Playa Francesa courtesy of the Azores high pressure system. Offshore seas look to be running the predicted 12 to 20 feet (four to six meters) from the northeast. 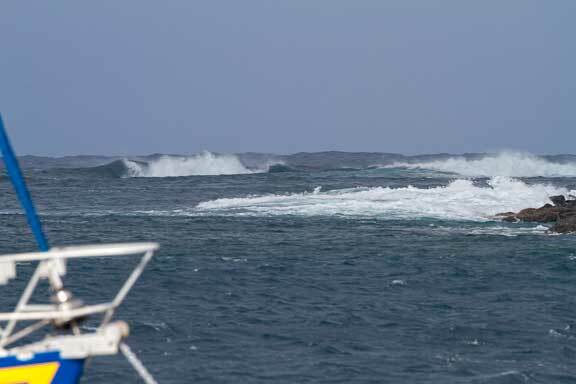 With the seas and wind aligned we’re thinking the risk is low of these waves wrapping into the anchorage. We are hanging out for the moment (but have moved to the outer fringe of the anchored yachts so we can depart quickly should the desire arise). 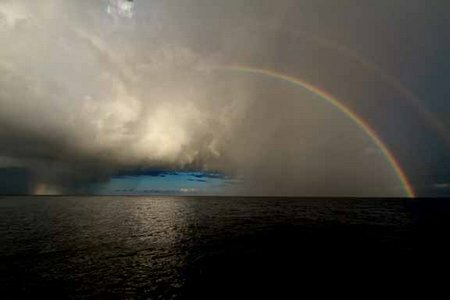 The photo above is looking to the southwest, into the open ocean. Back in the olden days, more than a quarter of a century ago, the Deerfoot 2-62 represented our best shot at the ultimate short handed cruiser. As we are presently in the same neighborhood as Moonshadow, it has been interesting (and enjoyable) to have a close look at this design after all these years. 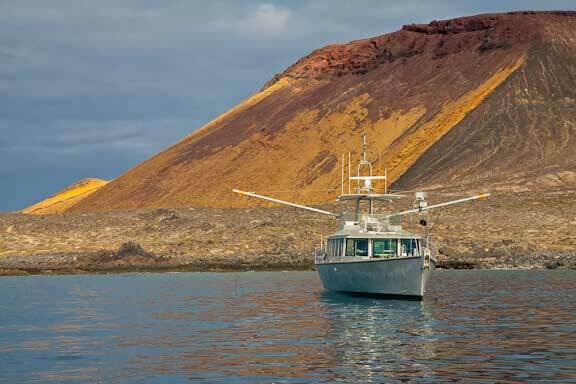 We’ve been anchored under the caldera in the background (photo above) off and on now for more than two weeks. This morning, when Katy and Kirk Braun from nearby Interlude knocked on the hull and announced a climb in the afternoon, it did not take us long to accept. We had a drawing that had to be finished, a stack of e-mails to answer, and it was time to pack our gear. The forecast was for light east to southeast breeze , starting around midnight. The GFS model got the time and direction, but as you can see above, was a little off on velocity. This 90 degree wind shift created a series of problems. 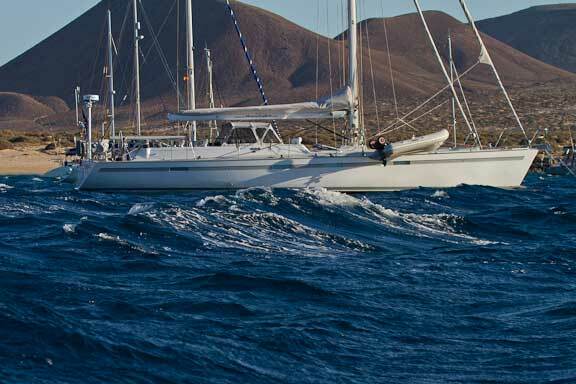 Crowded anchorages, neophytes with light ground tackle, and a bit of breeze can lead to getting up close and personal.